Canine Influenza Virus (CIV) is a contagious respiratory infection in dogs. There has been a lot of press related information on canine influenza disease over the last couple of years. We all know that the “flu” causes significant health problems in humans and we all have grown up with the Asian Flu, the Swine Flu, Bird Flu and so on. Every year the vaccine changes in response to the changes in the flu virus as seen by the clinical research. Influenza A viruses are given a moniker based on their hemagglutinin, “H” and their neuraminidase “N” activity. There are at least 16 H and 9N designations and this can be confusing for sure given the number of combinations. There has been recognized influenza in our canine companions since 1999 which was designated H3N8 and there is now a current vaccine for that strain. If you own a dog you may have already had the canine influenza vaccine given to your pet. Since 2007 a second strain labeled H3N2 was recognized and is associated with the most recent outbreak as recognized in Chicago and the Atlanta areas in 2015. It is not the typical dog flu strain (H3N8) that is treated nationwide. 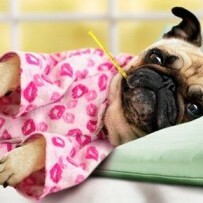 Now just like in people, your pet can develop the flu in spite of being vaccinated. Now don’t go and call your family veterinarian to get another vaccine because there is no approved vaccination for the most recent strain. The jury is still out as to the amount of cross protection the current vaccine affords against the new strain. The veterinarians here at Gainesville Animal Emergency are taking steps in light of this new outbreak. You may be asked to remain in the car or have your pet placed in isolation if canine flu is suspected at your visit to reduce the risk of the other patients. We also take measures to reduce contamination of the premises. If your dog shows signs of fever, persistent cough, nasal discharge that may be initially clear then changes color, or difficulty breathing you should see your family veterinarian. However, if its past regular hours we will be there to help you out as well! Be vigilant, if you use the services of a canine day care, observe other patrons pets for these signs or ask outright if there are any sick pets before you leave your pet.